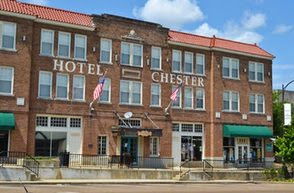 In this Hotel Hell episode, Gordon Ramsay visits Hotel Chester in Starkville, MS, a hotel located next to a college campus. The hotel was booming when it was bought by David and Sukie Mollendor in 2000 but the couple have been forced to file for bankruptcy. Their home was foreclosed and they were forced to move into the hotel. The hotel was running smoothly until David was in a car accident and bed ridden for 6 months and Sukie had to leave her job in real estate. Gordon can't find the hotel and has to ask for directions. Gordon arrives and speaks to David who explains that he graduated with a major in hotel management, doesn't think there any issues but reveals that the rooms haven't been updated in 10 years. Gordon goes down to the restaurant to eat and finds that all the food is Japanese. Gordon sits waiting for around an hour but gets fed up, Lindsey finds him sleeping on a couch and he finally tastes the sushi, which is disgusting. Gordon tells Sukie he doesn't like the sushi, she runs off to tell David. The dinner service is busy but an hour in the first table haven't even got their food yet. Sukie is having trouble in the kitchen and Gordon learns that she has been struggling since David's accident. Gordon heads over to a supermarket to pick up some ingredients to cook the waiting customers some food. Sukie tells Gordon that they live in the handicapped room since the accident and learns that he broke both his back, ankles and has been recovering for the past 5 years. The next day Gordon drives them to local successful businesses and they explain that their success is down to the student trade. Gordon reveals changes to the hotel including modernised rooms, a revamped room for David and Sukie and the beer garden has also been given a makeover. The menu has also been changed, featuring local food which will be appealing to the students. A new head Chef is bought in with Gordon paying the salary until they can afford to. Young locals arrive and the beer garden impresses everyone. Before he leaves he takes David and Sukie out for a drive and shows them an apartment he has rented for them for 6 months. Yelp reviews and Trip Advisor reviews since Gordon visited are mostly very positive, with compliments on the friendly and helpful staff, the beer garden and the breakfast. Planning a visit to the hotel? Check out their website for further information. Hotel Chester aired on August 11 2014, the episode was filmed in June 2013 and is Hotel Hell season 2 episode 4. My favorite episode until now. I fell in love with those two and it was nice to see Gordon finally off his angry cursing character. He is such a sweet man. Made me cry .... watched it more than 10 times .... such a sweet couple & ramsy was such a doll .... awesome! This was most probably the most significant episode that really touched me. Moreover its fantastic to see that there are no unnecessary dramas at all in this particular episode. I actually cried a little watching this episode. I wanted to hug them all. This should prove Gordon is a good man. Loved this episode. It even made me cry. Thanks Gordon for the fantastic person you are! I just saw this episode and wow! Never have I seen two more deserving people of Gordon's assistance. No arguing, no dramas, just a willingness to accept his help. I wish David and Sukie all the best in their future. Greetings from an Aussie living in Sweden. This episode proves that you don't need over the top drama for a show like this to be a hit. What a lovely couple and so deserving of Gordon's help! I saw that episode at TLC in Russia, it has touched me really a lot, I am so happy, Gordon helped them and they accepted that so wishfully! All the best, I really love to see American historic hotels in small cities revive again! This is the best episode I have ever watched on Hotel Hell. So touched by this family and Gordon's generosity. Glad to see they are back on their feet. It is so beautiful to see people helping each other. One of Ramsay's best episodes. Really shows the good side of the man. Nice to see there are still people out there willing to help out the Good people in need. In my opinion, there are many he has helped who have not been at all deserving of such. Agreed! He helped to super people in time of need - giving their children an option to continue the legacy of this beautiful place! Love this couple they seem so cute together. I wish the best for them and their family. Does anyone know if the lovely couple still owns the hotel? They do, and business is thriving. Love this episode best! It sees the sweetest side of both Gordon and humble people like Dave and Sukie who are not egoistic and most willing to accept anything that Gordon planned. The makeover and a home, were the owners' just reward. Lovely couple, happy that both they and Hotel Chester are still going strong. I am so happy that they still operate they truly deserve it. such a sweet family. Lord, I am in tears after watching this episode I just had to find out if they were still open! So nice to see an ep that isn’t ungreatful people who have brought it on themselves - this pair fell on hard times and it’s lovely to see them doing so well, and how amazing is Gordon for all he did for them? Not sure when I’ll recover! After watching this one, I turned to my girlfriend and said, 'we have to go here.' The food looked incredible. Given that David had 40 years of experience combined with the patience Gordon showed them given the sensitivity of the situation, it would be absolutely tragic if they closed. I loved this episode. They were so kind. I also just watched this episode for the first time and was also brought to tears...and also had to research after! So glad that they’re doing well. Couldn’t want it for a more resilient, lovely family. Well done! I've just watched this for the first time here in the UK on Channel 4, and am watching it again now on Channel 4+1. Like many others have said it has moved me to tears. What a lovely couple and Gordon has a good heart. Best episode ever and I'm really glad they are doing well now. I would fly to the US just to meet Dave and Sukie. I just finished this episode tonight on YouTube, and then jumped on here to see if the hotel was still open...and I cheered when I saw the words OPEN! Of all the hotels Gordon has worked on, this is one of the few which brought me to tears because not only did it show this tough man has a good heart, but we got an honest to goodness happy ending with two people who deserved it. I've never planned on going to Mississippi, but if I did, this would be the reason!